First post so please be nice! Was looking for a decent priced draught excluder and came across this deal at Dunelm Mill. Thought it was great seeing as Argos are selling theirs for £9.99 and it doesn't look half as nice as these ones! Cheapest at Asda is £5.00 and in John Lewis and M&S they can be anywhere from £12.00 to £25.00. Could be useful to buy ahead for Winter. The non pattern ones were 3.99 now 1.99 too, saw in local store today, went to buy one but took so damn long at the till with other staff wondering around I walked out. Went to this shop with the wife today - the shop music was dreadful I had to sit in the car. If your going to this shop wear ear protectors. the shop music was dreadful I had to sit in the car. If your going to … the shop music was dreadful I had to sit in the car. If your going to this shop wear ear protectors. lol, I feel like this in most supermarkets. And other shops. Malls, too. And most everywhere else. 'stylish' ?! Haha. Ok. Good price though! I think some of these are very cute. Got the owl and cupcake ones for my girls, they both love them! 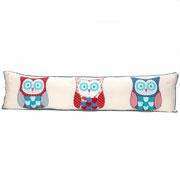 We use them as side cushion between bed and wall there very cute and "shabby chic". I would definetly recommend them! Deal posting newbie! This is Kelism first deal post. Help out by leaving a posting tip or just to show your appreciation for their contribution.